If you saw the film title Sword of the Stranger without knowing anything else about it, you might guess it was a no-nonsense action flick, perhaps with a Man With No Name hero and a great many bladed weapons. And you’d be right. It’s also an anime by the Cowboy Bebop studio, but rather than being set in outer space, this is a pic set in medieval Japan. Like many samurai adventures, it may remind viewers of the celluloid Wild West. Apart from the no-name hero, its main characters are a perky little boy and a dog, but don’t go thinking the film will be soft. It has limb-loppings, geysers of blood and a body-count to impress Tarantino. The little boy’s called Kotaro and he’s on the run, for plot reasons revealed later. 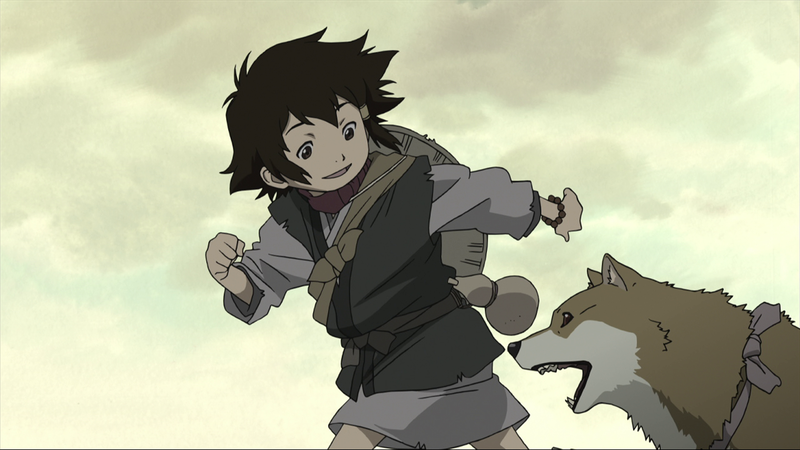 Accompanied by his utterly faithful dog, Tobimaru, he’s eking out an existence in a remote, abandoned temple, where he’s outraged to find another squatter, a nonchalant young man who calls himself Nanashi (Japanese for ‘no name’). Kotaro takes against the stranger instantly – he’s not the trusting type – but their squabble is interrupted when armed soldiers come to the temple, hunting Kotaro. That, of course, leads to more fighting. Some viewers may appreciate the film’s period trappings and rugged landscapes (the film starts in grey mountains, and climaxes in a snow-globe blizzard). The story is lifted by the winning relationship between Kotaro and Nanashi; it compares to that in the Coen Brothers’ version of True Grit made three years later, between the soft spoken Jeff Bridges and the peppery Hailee Steinfeld. But it’s the fighting in Sword of the Stranger that most viewers will come to see. Indeed, the film’s real villain lives for nothing but a duel that can kill him or fulfil him, or both. The action in Sword is fast – combatants feint, zag and slice at speeds that are hard to process on first viewing, although animation buffs will have a ball parsing the killer beats on frame-by-frame advance. One character is bewildered to find one of his limbs dangling comically from a sliver of flesh; the moment evokes Kurosawa’s grim humour as much as Monty Python. Another combatant is reduced to a bloody pin-cushion, a la the finale of Kurosawa’s Throne of Blood. 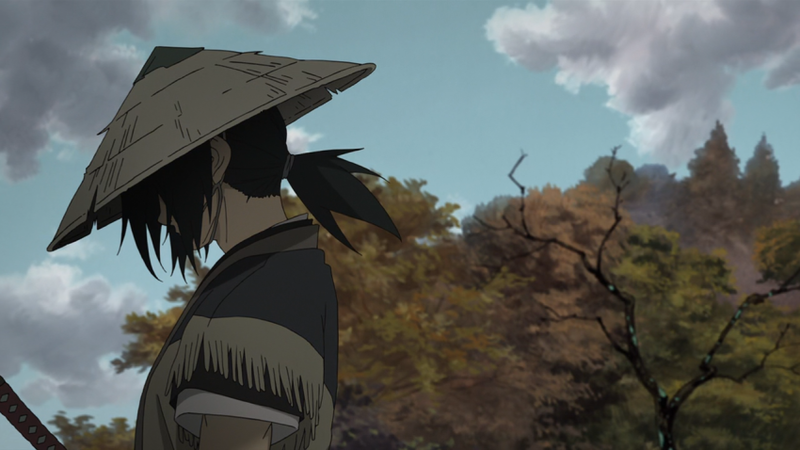 Director Masahiro Ando likewise suggests that Sword of the Stranger was made with an eye to non-Japanese audiences. While he namechecks jidaigeki films and a 1985 swashbuckling anime, Dagger of Kamui, he also says he wanted elements of Clint Eastwood and even James Cameron actioners. A point of trivia: Sword was first conceived as being about an assassin with no memories, like a samurai Bourne. The final film feels most Japanese in its reflections on loyalty and personal ambition, and how they illustrate the values of a period. Given the stereotypical image of Japanese values enshrining loyalty unto death, it’s bracing and shocking to see those values literally trampled in the mud. The hero Nanashi’s own samurai background leaves him with nightmares of a crime against innocents, committed in the name of duty. Nanashi is voiced in Japanese by a bona fide celebrity, Tomoya Nagase, a singer and live-action actor taking his first anime role. Similarly the boy Kotaro is voiced by a teenage male idol, Yuri Chinen. The big anime names are in supporting roles: Koichi Yamadera as the blue-eyed villain Luo-Lang, and Akio Ohtsuka as the ambitious vassal Itadori. Yamadera and Ohtsuka are two of the biggest beasts in voice-acting; you may know them as Togusa and Batou respectively in Ghost in the Shell. Sword of the Stranger is released in the UK by Anime Limited.